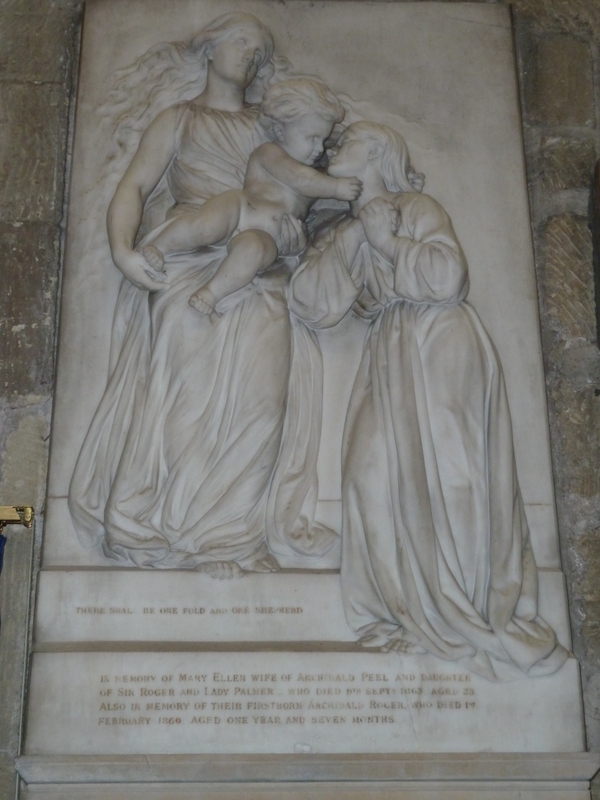 Last week I was in Wrexham, North Wales, and had a look in the Parish Church of St Giles, where there is a monument sculpted by the Pre-Raphaelite sculptor Thomas Woolner. Woolner is one of the less popular Pre-Raphaelites, despite having been a member since its inception. 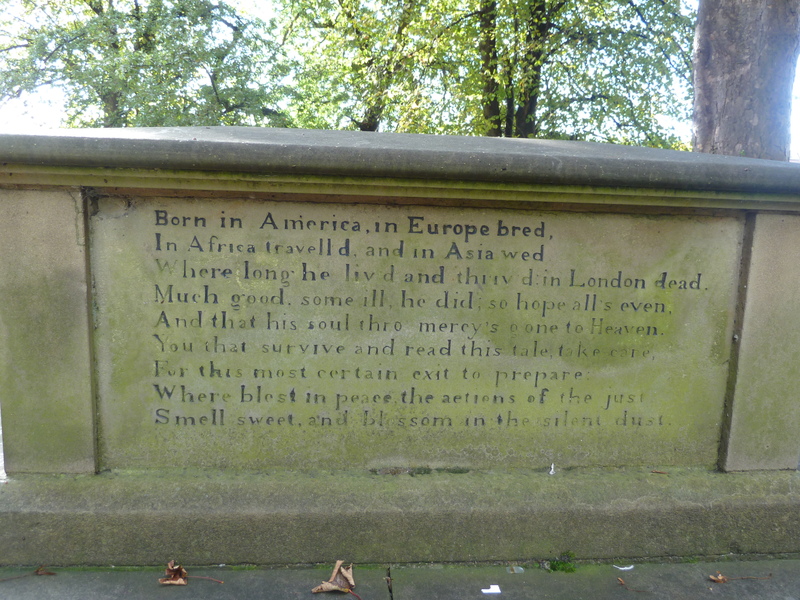 The only sculptor of the Brotherhood, he contributed a poem, ‘My Beautiful Lady’, to their magazine The Germ. He was later Professor of Sculpture at the Royal Academy, but his work both poetic and sculptural is often overlooked since his death. This beautiful monument is to Ellen Peel, and the insciption says she was the daughter of Sir Roger Palmer of Cefn Park (a survivor of the Charge of the Light Brigade, and buried in the churchyard at St Giles) and wife of Archibald Peel of Marchwiel (don’t you love how women in history are usually defined by their male relations?) According to the guidebook, it “shows Ellen being greeted by her infant son, Archibald Roger, who had pre-deceased her”. There is pathos of a particularly Victorian kind here: the bereaved mother, only 33 when she died, is greeted by her dead son, when they are reunited in Heaven after death, thus presenting a happy life after death for Ellen. Beneath the relief sculpture is the motto ‘There shall be one fold and one shepherd’. Yet it doesn’t seem overly sentimental: there is pathos but there is also joy, of a religious and also domestic kind; typically, for the Victorians, it envisions a domestic afterlife in which reunion with the dead and a kind of resumption of lost love and a domestic centre feature strongly. This monument shows Woolner’s talent for figures, in my opinion, though it is very different from his more famous sculptural portraits of Dickens and Tennyson, for example. Incidentally, St Giles is well worth a visit for other reasons, most prominent among which must be the tomb (right) of Elihu Yale of Plas Grono, who was born in America but returned to his family home in North Wales, a very wealthy man who made many gifts to St Giles and was also the primary benefactor of Connecticut College, which was renamed Yale after him – the rest, as they say, is history. There is also, on the outside of the church, a stone which replaces one which was presented to Yale University in 1918.